Techna-Tool Inc. is a provider of contact, as well as non-contract tool and process monitoring systems for a variety of applications. With a market presence for more than two decades and having worked with customers from diverse industry segments and thousands of installations across the world, Techna-Tool has helped its clients automate their production processes efficiently. Techna-Tool is proudly set to participate and exhibit its products at the Precision Machining Technology Tradeshow (PMTS) 2019. The 10th installment of this event is scheduled from April 2 to 4, 2019 at Huntington Convention Center of Cleveland, Cleveland, Ohio. Do visit us at booth number 4004. The event also gives an opportunity to know more about the latest requirements in the machining industry. It is also a good platform to learn the current industry trends and best practices, see innovation by various exhibitors, gain prospective customers, connect with industry peers, and increase the network. The Precision Machining Technology Tradeshow (PMTS) was started in 2001 and is organized once in two years. 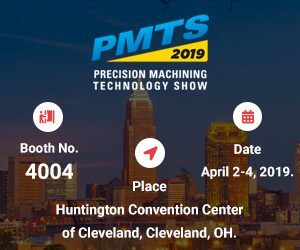 The PMTS event is organized by the Precision Machined Products Association along with Production Machining, Products Finishing, and Modern Machine Shop. At the event, one can expect more than 300 exhibitors of precision machining equipment and systems and over 6000 manufacturing professionals. It fosters product technology, business development, and process innovation in the precision machined parts industry. The event comprises classroom-style technical sessions, knowledge centers, machining demonstrations, and more. PMTS has been recognized as one of the “Fastest 50” events in 2013 and 2015 by the Tradeshow Executive magazine. Attending this event may be beneficial for contract manufacturers and engineers, managers, and owners of OEMs in ways more than one. With the event dates nearing, the team at Techna-Tool is well prepared to showcase and explain its products to all the visitors. The company is looking forward to this three-day experience, which will certainly prove useful to it in the future. This entry was posted in Broken Tool Detection Systems, Events. Bookmark the permalink.